Dorothys English Medium School is in the process of being built and the children are currently being schooled in the Evangelical Lutheran church at Ngorika. The Bishop of the diocese, in his ordination speech called on the government to fight against corruption, for affordable primary and secondary education and more help towards Social Services, particularly education and health. The Bishop had asked that the school be named in memory of Dorothy. Thade our friend and driver is also involved with the school as the church he attends in Moshi are supporting this church. Thade paid for the altar, pulpit and lectern and is contributing to the building of the school. After the official opening of the well the Bishop ordained a new pastor and baptised 10 babies. 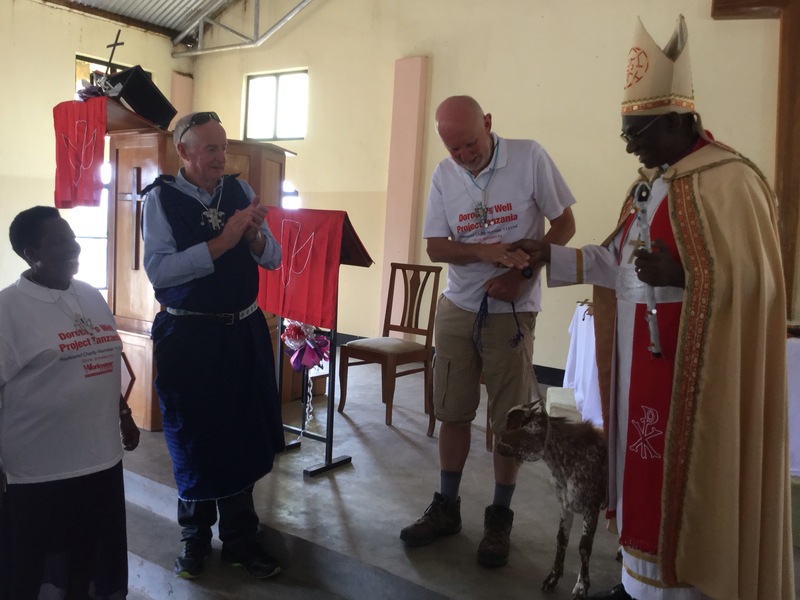 The Bishop was presented with a goat from the Masai, he in turn presented it to Chuck who in the past contributed £20k which enabled a well to be sunk at Matsu Wa Tembo. The usual ritual is to present the goat back and ask the Masai to look after it. Ths well also serves Juhudi Primary school which is 2km away. When we did a site visit there in 2016 some of the children had contracted Malaria through drinking water from Lake Simanjaro. Together the schools have 425 pupils and a surrounding community of around 4000.